Challenging spaces, like this two story room with a sloped and varied height ceiling, can be transformed into a beautiful and useful space in the hands of a skilled and experienced closet designer. These custom closet cubbies were built into the end of the closet island to organize the owner's unique belt collection. These custom walk in closet organizers provide elegant storage, transforming a difficult space with varying ceiling heights into more than just a closet. It is a private retreat featuring seating, a large closet island, enclosed cabinetry with Swarovski crystal hardware, modern chandeliers, stone countertops, and a hidden safe, as well as a place to store everything. Its location off the en suite transforms this room into a relaxing dressing room for the homeowners. This wardrobe style closet section with cabinet door creates a separate shoe closet to store the owner's footware. It is built to fit against the room's sloped ceiling. Walk in closet organizers such as these drawer dividers add extra storage for small items in the closet island. All of the closet sections in this closet design with sloped ceilings are optimized to create the most storage for a room with varying ceiling heights. The addition of a comfortable chair next to the closet island allows the closet space to do double duty as an "away room" and private sanctuary for the owner. 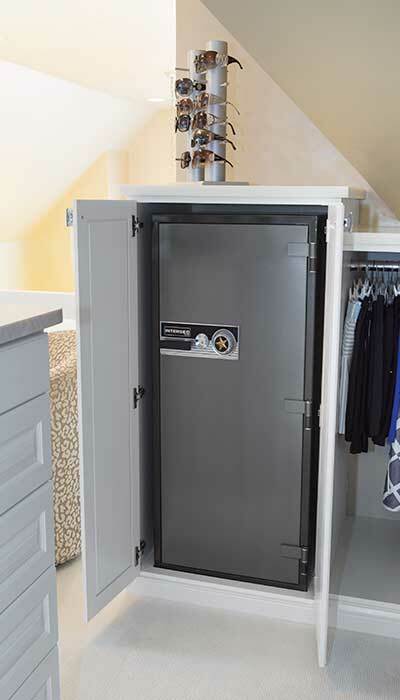 Closet cabinet hides a large safe. Glass doors used to cover hanging and shelving areas. Closet built ins maximize storage for hanging clothes with the addition of storage for purses behind glass doors.